It’s hard to get dinner done each night. With all the prep work and the kids complaining and fighting, it can be maddening. 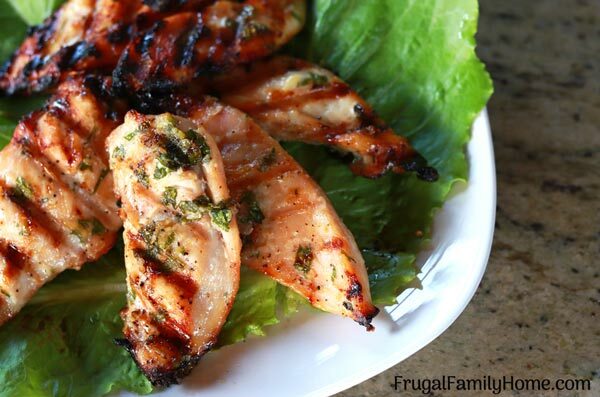 But what if you could have a delicious garlic parsley chicken recipe waiting in the freezer? Wouldn’t that be helpful? All you would have to do is thaw the chicken and cook it. All the other prep work is done. Making dinner so easy to get done. Before you say, I’ve tried freezer cooking, it doesn’t work. I spent all day cooking and was so tired at the end of the process, we ate out. I hear you. That’s how I used to freezer cook too. I’d go to the store buy all the ingredients needed, even the ones that weren’t on sale. Spend more money than I normally would on food. Then I’d spend all day chopping and prepping ingredients. Then next day I would spend all day cooking, cooling, and loading the freezer with food. After two days I was beat. And we would end up eating dinner out. The rest of the month was nice, having meals ready to go, but I knew there had to be a better way. That’s when I discovered meal packs. I’ve found freezer cooking this way saves me money and time. And I’m not exhausted when I’m done either. Instead of shopping, prepping, and cooking all day for two days. I only freezer cook when I find meat on sale. Then I buy what I can afford, make the freezer meals (no cooking involved) and load them into the freezer. I usually can stock 10-40 pounds of meat in about an hour. 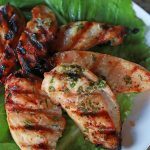 This garlic parsley chicken freezer recipe is one that is so simple to make. You measure the ingredients, add the chicken to the freezer bag. Pour the marinade on and freeze. That’s it. Your meal pack is done and waiting for you. So easy peasy. There are only 7 ingredients need to make this garlic parsley chicken recipe. You can prep it for the freezer or marinate it just an hour before cooking it. Be sure to keep scrolling down for the printable recipe and recipe video too. I know this recipe is simple, but I made a quick recipe video so you can see it made and see how easy it is. I’ve included the cooking process for grilling the chicken in the video. But you can also bake, broil or even pan fry this chicken. Check out the tips below. Be sure to grab the printable recipe too..
Place the oil, honey, parsley, garlic, salt and pepper into a bowl and stir. 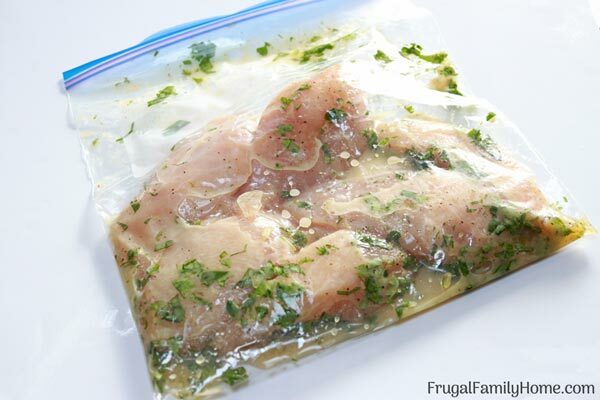 Place chicken into a zipper topped freezer bag and add the marinade. Remove as much air as you can, label and freeze, if making for the freezer. If preparing for that day let the chicken in the bag marinate in the refrigerator for an hour or overnight if desired. When ready to cook, heat a clean grill to 375 degrees. Once warm, place the chicken on the grill. Discard leftover marinade. Cook on one side for 15 minutes or until chicken looks opaque white. Flip the chicken over the cook on the other side until cooked through. Remove from grill cover and let sit for about 10 minutes. While we prefer to grill this garlic parsley chicken recipe. You can cook this garlic parsley chicken quite a few different ways. Which makes it perfect to prepare no matter what kind of day it will be. I’ll go through each one so you can pick which one works best for you. Grill, this is our favorite method of cooking. Heat the grill to 375 degrees. 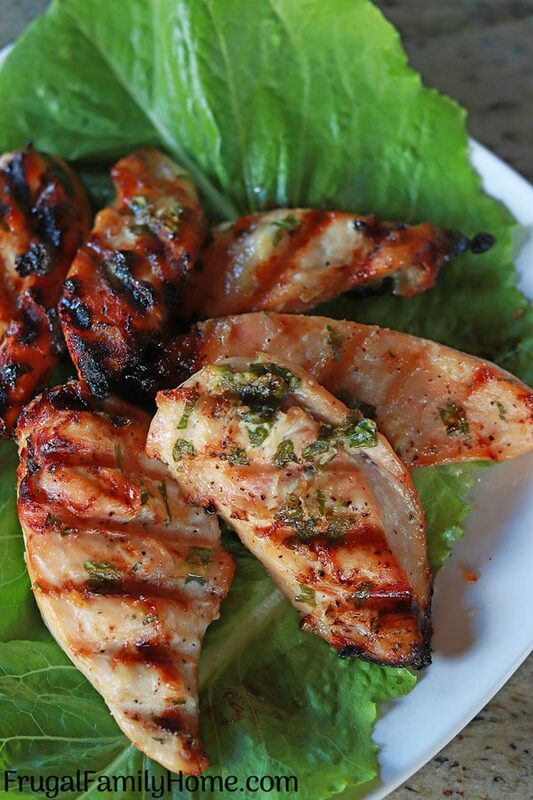 Clean the grill place the chicken on the hot grill and discard marinade. Cook on one side for 15 minutes flip and cook until done on the second side. Bake, If making sheet pan dinners is more your style, or it’s winter and you don’t want to grill. You can bake this chicken on a sheet pan with vegetables for a full dinner right out of the oven. Chop your vegetables. Leave the faster cooking vegetables larger so they don’t get mushy. Add a little oil and seasoning to the vegetables and spread out on a baking sheet. Leaving a little room for the chicken. Add your thawed chicken to the baking sheet. Discard the leftover marinade. And bake at 400 degrees for about 30-45 minutes or until the chicken is cooked through and the vegetables are done. This makes a full dinner in just minutes of hands on time and leaves you time to do something else while dinner is cooking. Yay! Slow Cooker, If you know you’ll have a busy day, add the thawed chicken package to the slow cooker. Set it on low and let it cook while you go about your day. In about 6 hours your chicken should be cooked through, depending on how big the chicken pieces are and ready to eat. Add a side dish of mashed potatoes and steamed broccoli and dinner is done. Broil, If you want your chicken grilled but the weather is too cold to grill, try broiling it. It’s turns out good this way. Place the thawed chicken on a sheet pan or broiling pan. Discard marinade. Place in the oven about 3-6 inches away from the top element. Broil on one side about 10 minutes and flip over the broil until done. If the meat is a thicker, place it farther away from the heat source and let cook longer. If the meat is thinner, you can place it closer to the heat source and cook for a shorter amount of time on each side. Be sure to check the chicken is cook through. Pan Fried, if you’ll be pan frying the chicken it’s best to do this method with thinner cuts of chicken. If you butterfly cut the chicken breast first, that is the best bet for this cooking method. If the meat is too thick, it’s harder to get it cooked through without overcooking the outside. Heat the pan on medium to medium high and add a little oil to the pan. About 1 tablespoon. Once the oil is warm, add the chicken and cook on one side until it’s golden brown. Flip the chicken and cook on the other side. Check for doneness. If the chicken is cooked through, you’re ready to eat. If the chicken isn’t cook through, turn down the heat and cover the pan and let it cook until done. I will flip the chicken from side to side during this time so it doesn’t burn or get overly browned. If I butterfly cut the chicken before pan frying it will cook quickly. This method doesn’t work as well with thicker cuts of chicken. How Much Does it Cost to Make this Garlic Parsley Chicken Recipe? I like to know how much a recipe will cost me to make. It helps me pair less expensive meals with more expensive meals during the week to keep food costs in check. Here’s the breakdown of this recipe for you…. That brings the cost of this recipe for 4 servings to $2.38 or just $.60 a serving. That’s not bad at all. Add a half bag of frozen vegetables for $.50 and make a cup of rice for a side dish at $.38 and you have a full meal for just $3.26 for a family of four or just $.82 per meal. Now that’s a frugal dinner for sure. Thanks for encouraging us to try freezer cooking again. This looks delicious. Will definitely be giving this a try. I’m an odd person in the sense that I actually enjoy those busy kitchen days where I do nothing but cook so that I don’t have to another day.